Wilbur Hackett knew what to expect. 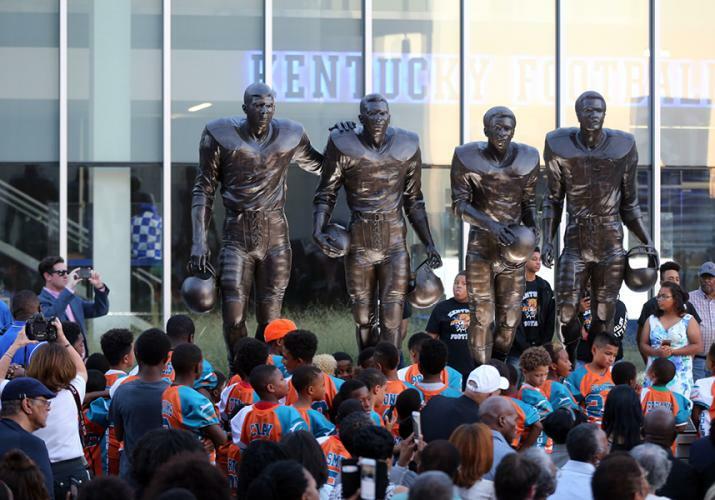 When he signed on to play football at the University of Kentucky in 1967, realizing he’d be one of only a handful of African-American players in the Southeastern Conference, he already knew how tough it was going to be. What he didn’t know was how history was going to play out. Who possibly could have foretold his story? And now, a measure of immortality. Greg Page and Nate Northington will stand on the concourse between Commonwealth Stadium and the new practice facility. It’s fitting – because those men bridge the historic gap between the Jim Crow era and today’s SEC – arguably the best league in college football, where African-Americans now play for schools that once were prohibited by state laws from allowing blacks to play with whites, where the Stars and Bars proudly unfurled in bleachers, where the only black faces belonged to the folks who cleaned up after the games. Winchester, then Louisville, he had been called names and known his share of fistfights. He had suffered the humiliation of being forced to sit in the back of the bus, or upstairs at the local movie house, instead of downstairs. That’s where the white people sat. Still, he jumped at the chance. “I was a 17-year-old man who wanted to get an education, play football and enjoy my life,” he said. And he knew there would be scary moments. But he never gave in to fear – not a guy who, as a middle-schooler, had to fight his way home through the projects. “We had to fight every day,” he said. “You had to be tough to walk though there. I’ve never been scared of anything. When I was at UK it was a challenge, but being scared wasn’t part of who I was. You can’t be scared and be a football player. You can’t be scared and accomplish anything. Wilbur Hackett and his friends. 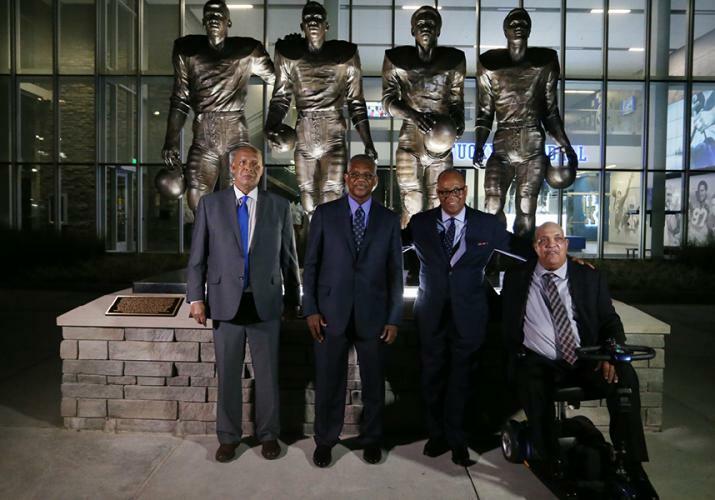 Karem helped lead the movement to recognize the four, including Page, who died in 1967 from an injury he suffered in practice, and Northington, the first black player ever to appear in an SEC football game, before leaving the team midway through the ‘67 season. He also credits the administration that oversaw the university back then, as well as head coach Charlie Bradshaw, for becoming the first SEC school to welcome a black player. Lest anyone forget, life-sized figures of the four, cart in bronze as hard as their resolve, are standing as a monument to their courage – a reminder that you can’t be scared and accomplish anything.